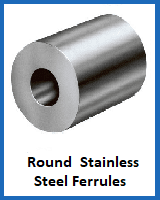 Stock up on bespoke stainless steel ferrules right here at Rope Services Direct. In addition to our custom wire rope assemblies, you can find a variety of ferrules, made with materials that fit different scenarios. Stainless steel ferrules are cost-effective and commonly combined with stainless steel wire rope. What are Stainless Steel Ferrules? A ferrule is the fixture which usually sits at the termination point of a wire rope. This helps with keeping things neat and typically securing it in a loop which can contain an eye so that it can be used for fastening. 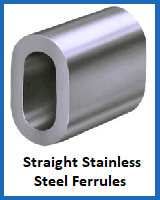 A stainless steel ferrule has the benefit of being best suited to use in conjunction with a wire rope made from the same material. This is because if an aluminium ferrule is chosen instead, it can create electro-chemical corrosion that compromises the integrity of the entire assembly over time. Our stainless steel ferrules let you form an anchor point in a cable, and we deploy a number of different dies depending on the size and shape of the ferrule so that the bond it creates is tight and safe. Fit is important in this instance, but the choice of material is also crucial. Stainless steel is an effective option in many situations, although there are other choices like carbon steel ferrules that are even tougher. Cut through any confusion you might have about stainless steel ferrules by talking to the Rope Services Direct team. Contact us is as simple as using the rapid response form on our site or calling 01384 78004 to speak to a specialist. Stainless Steel Ferrules Overall rating: 5 out of 5 based on 6 reviews.